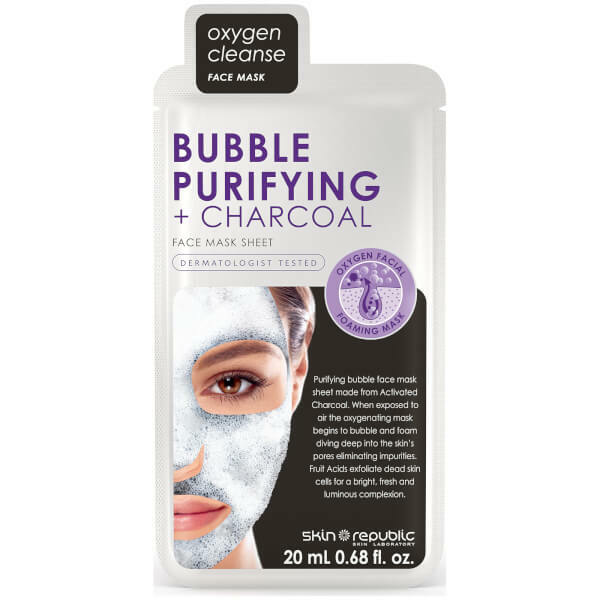 Rejuvenate your complexion with the Skin Republic Bubble Purifying + Charcoal Face Mask; an innovative treatment to dissolve impurities and stimulate cellular renewal. When applied, the sheet mask creates a foaming effect when exposed to air that delivers deep down cleansing with the bubbles effectively unclogging pores and eliminating dirt. A selection of fruit-derived acids work to gently exfoliate the surface layer of skin, while Charcoal is renowned for its detoxifying properties. Skin feels luminous and fresh with enhanced moisture and a revitalised tone. 2. IMPORTANT: Rub sachet for few seconds to activate bubbles. 3. Tear open sachet. 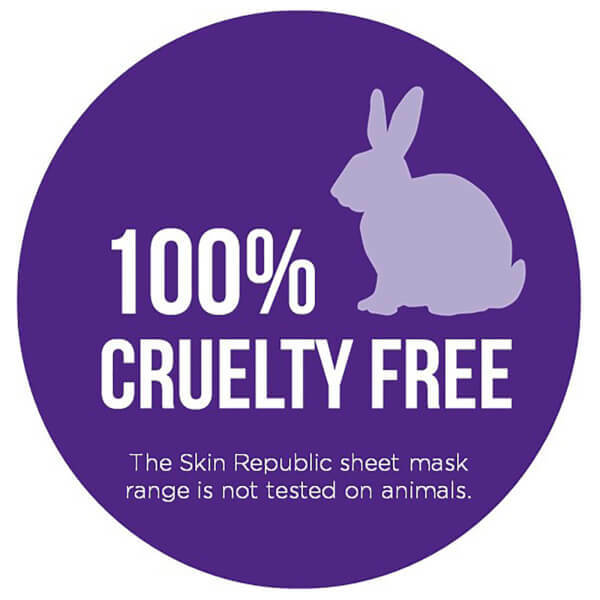 Remove mask from packaging. Unfold and place onto face. 4. Wear for 15-20 minutes. The mask will begin to bubble and foam. 5. Remove mask. Massage excess bubbles and foam into skin. 6. Rinse off with water. 7. For best results use once a week for a deep cleansing treatment or as required. To ensure skin compatibility, it is advisable to test a small area of the skin before use. Use the mask immediately after opening to prevent essence from drying out. Aqua/Water/Eau,Glycerin,Dipropylene Glycol, Methyl Perfluorobutyl Ether, Methyl Perfluoroisobutyl Ether, Ammonium Lauryl Sulfate, Cocamidopropyl Betaine, Citrus Paradisi (Grapefruit) Fruit Extract, Betaine, Sodium Polyacrylate, Xanthan Gum, Pyrus malus (Apple) Fruit Extract, Panax Ginseng Root Extract, Punica Granatum Fruit Extract , Hamamelis Virginiana (Witch Hazel) Extract, Rosa Centifola Flower Water, Lavandula Angustifolia (Lavender) Extract, Morus Nigra Fruit Extract, Solanum Lycopersicum (Tomato) Fruit Extract, Melaleuca Alternifolia (Tea Tree) Leaf Extract, Ethylhexylglycerin, Citrus Aurantifolia (Lime) Fruit Extract, Citrus Limon (Lemon) Fruit Extract, Citrus Aurantium Dulcis (Orange) Fruit Extract, Vitis Vinifera (Grape) Fruit Extract, Charcoal Powder, Disodium EDTA, Chelating Agent, Phenoxyethanol, Parfum/Fragrance.